George b. Hollowforth, Woodplumpton, Lancashire, 1869. m. Rosalie (Rosie) Paul abt. 1890. George d. 1921, Pachuca, Mexico. Martyn, nephew of Professor (Sir) Richard Threlfall (14/8/1861-10/7/1932) who founded the first School of Physics at Sydney University. Martyn was grandson of Richard Threlfall of Hollowforth, Preston, Lancs, a wine merchant, small landowner and mayor of Preston 1855/56 (click here). Martyn: University of Sydney 1915-1917 inc. (click here for 1915 report, here for 1917). Martyn first became a journalist with the Sydney Morning Herald. Then: Prime Minister Scullin's Publicity Officer 1929-1930. Next: Senior Private Secretary to Prime Minister Joe Lyons from 1931-1934. 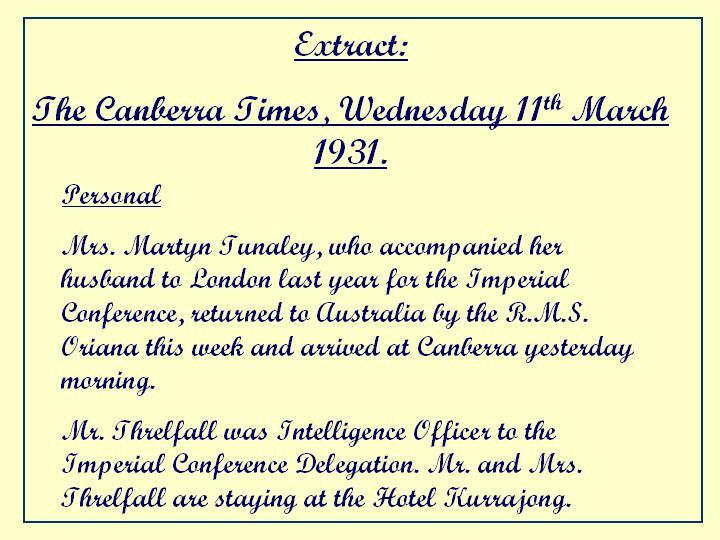 Then: Martyn headed up the London office of the Sydney Morning Herald before returning to Sydney, 1937 where he continued to write for the S.M.H. during and after the war. Martyn d. 25th May, 1966, Sydney. (There is a memorial plaque to Martyn at the National Suburbs Memorial Gardens, North Ryde, Sydney). In Tom D.C. Roberts' 2015-published book, "Before Rupert: Keith Murdoch and the Birth of a Dynasty", the author writes that, following Joe Lyons becoming P.M. in 1931, newspaper mogul (Sir) Keith Murdoch, father of the now-more-famous Rupert Murdoch, recommended Martyn Threlfall, then a jounalist for the Melbourne Herald, for the position of Lyons' "political" (private) secretary. "Threlfall started immediately". Points of interest: One of the first Schweppes maufacturing branches was set up in Friar Gate, Derby, operating successfully 1812-1893. The first manufacturing base in Australia was set up in Sydney 1877. Click here for further details. The engineers associated with Jacob Schweppe's invention for producing artificial mineral water, around 1790, were Jacques Paul and his son Nicolas Paul. The author notes that Martyn's maternal grandfather was Edmund Monson Paul, originally from Norwich. Rosalie: daughter of Edmund Monson Paul, Australian Consul for Russia 1855-1913. E.M.Paul in charge of Schweppes, Sydney branch, 1879-1900, after which Rosalie's brother E.S.W. Paul, took over. Edmund Monson Paul b. Norwich, 1825, moved to Australia 1852, died Sydney, November 1814. A record of M.M. Threlfall re: Joe Lyons P.M.
Nicholas: Plastic Surgeon in Sydney. "Martyn Monson Threlfall, Private Secretary to the Prime Minister and Cabinet Officer, Commonwealth of Australia", listed as awarded O.B.E. (Civil Division).